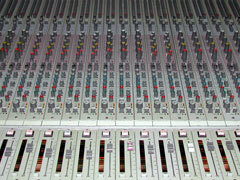 Kudzu Ranch Recorders :: Home of the Sounds That Grow On You! 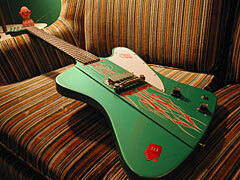 As anyone who has seen Southern Culture on the Skids live knows, Rick Miller has an enormous collection of vintage guitars, many of which are available for use in recording at the Ranch. Fenders, Gibsons and Gretsch live side by side with vintage Airline, Danelectros and Teiscos, so come take your pick! Make sure popups are enabled so you can click here for a guitar gallery! 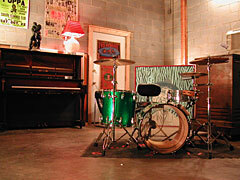 As with amps and guitars, a collection of effects live around the Ranch as well. Try out a classic reverb tank, delay, or any number of other effects, from classic to just plain krazy! The Kudzu Ranch folks have a multitude of vintage mics and analogue equipment, as well as state of the art digital services. 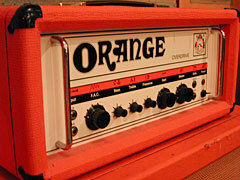 What vintage guitar collection would be complete without a boatload of vintage amps to go along with them? 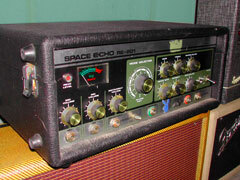 As with the guitars, the Ranch is happy to let you use any amp in the place. Heck, you can just line `em up and go down the line until you find one you like! Other instruments that call the Ranch home are drum kits, percussion playthings, organs and pianos, so feel free to add a little something extra at the last minute to your track!